Back to the roots: The Mara blouse! Exactly one year ago I was preparing the launch of my first commercial pattern: the Mara blouse. As you might remember, this versatile blouse pattern was called after a river in Maramures, Romania. Since we’ve travelled back to the very same village this summer, I wanted to go back to the roots of Compagnie M. All spotlights on the Mara blouse pattern! When the Louisa dress pattern was launched it became so popular that the Mara blouse pattern got a little bit pushed aside. That’s why I wanted to dedicate this summer to the Mara blouse pattern! About 70 international blogs will go back to the Mara roots with me and will show you the possibilities of my all time favourite Compagnie M. pattern. The Big Mara Blog Tour can be followed on the separate Mara blog page. Every day 2 blogs will add their creations. Make sure to visit this page often to get inspired! Feel like sewing along with this Mara blog tour? Yes you can! I’ve organised a sew-along that’s open to everyone! People with or without blog can participate. It’s a small international contest. So just join the blog tour by sewing your own Mara blouse! The most beautiful creations will win some great prizes! Sew your own interpretation of the Mara blouse pattern.You may follow the pattern but you are also allowed to modify the blouse in order to create something completely new. Just make sure that we can still spot elements of the original Mara blouse! I make it sound like this is a sew-along for the more experienced sewers, but that’s absolutely not true. Just be original. 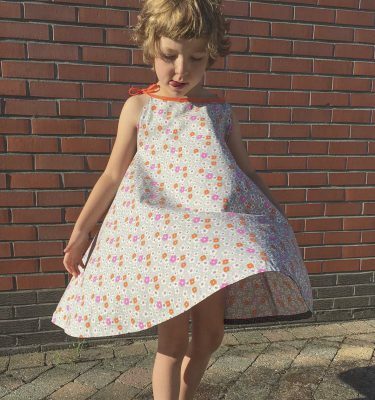 You can experiment with special fabrics, with adding some details or you can play with colours… Create something fun! The contest starts now and you have until August 17th at midnight (CET timezone) to publish your creation on the sew-along page. Especially for ‘back to the roots’ I offer you a 10% discount on the Mara blouse pattern until the 17th of August. Use MARA-ACTION at the check-out to claim this discount. How will we evaluate your work ? The jury will select a personal top 10 and rank these projects. This way we will make a short list of 10 most beautiful and creative Mara blouses. In a second round we will evaluate those 10 projects again to pick three final winners of the sew-along. This sew-along is open to everyone! Doesn’t matter where you live or how experienced you are. Do you feel like participating with several projects? You can! Go to the Mara blouse sew-along page and add your project with the InLinkz plug-in. You don’t need a blog to add your picture. First of all you can write a blogpost about the Mara blouse. To add this project to the sew-along, just fill out the url of your blogpost at the top of the Inlinkz page. Choose a name for your creation and a main picture to be displayed. When you don’t have a blog, I advise you to add your pictures to the Compagnie M. Flickr pool. Copy the url of this group (not of your picture) to the Inlinkz page. Choose one main picture to get displayed. You can add a short description to this main picture in Flickr if you like. It’s a good way to explain what you’ve been up to! When you don’t have a Flickr account, you can also upload one picture from your computer. It’s a basic way to show your project, since you will only be able to show one picture without any explanation.